Roads and paths give you the keys to other landscapes: The Medoc vineyards, le Pays Royannais, la haute Gironde and the beauties of Bordeaux. You will cross the vast peninsula of the Medoc. You will take a ferry to cross the estuary and will continue your trip on the other side, in Charente Maritime, then Haute-Saintonge and Haute Gironde. 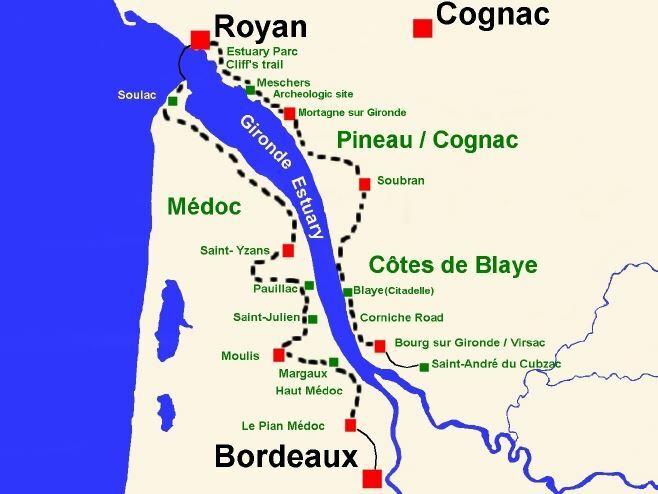 You will take the Wine Road of the Medoc, home of the most famous wine-growing chateaux in the world, then you will meet the winemakers of the famous “Cognac” and “Pineau” of Charente. You will cross some marshes, will visit windmills and old fortified castle, superb Romanic churches, caves and some unique Gallo-Roman sites. This journey with various landscapes alternates bicycle paths through forests and flat roads alongside streams and vineyards, will allow you to discover the exceptional natural surrounding which will fulfil yourself with its diversity. You will be warmly welcomed every evening in three or four star hotels and charming guest houses. Day 1: Arrival in Bordeaux and transfer to Pian Medoc. Arrival at Bordeaux’s train station or airport. Taxi transfer to Pian Medoc and accommodation in a three stars hotel. Welcome pack of the area and circuits will be given as well as your bike. The quality and the service of this hotel created a climate of peace and quiet which explains the “Grande histoire” of this traditional 18 bedrooms house with pool and over 2ha. Park. Fine and gastronomic cuisine, with the specialities of the area and a wine cellar, containing several of the “grands crus” of the Medoc. Departing from Pian Medoc to Macau, the chateaux’s road goes alongside the Gironde toward Margaux, Saint-Estèphe, Moulis...wine and spirit houses are waiting for you. If you go on jaunt toward the estuary, you will make the most of this itinerary without any difficulty whilst encountering pleasant and diversified landscapes whatever the season. This circuit will lead you to the heart of the “Médoc rouge”, where you will spend the night in charming guest houses, marrying traditional and contemporary cuisine. Departure from Moulis or Listrac for a cycling day into famous vineyards, among the hills covered with vineyards and across the marshes that separate them. You will also discover the history of Medoc through its remnants such as walking across the archaeological site of Brion in St Germain d’Esteuil, the Chateau of Castera, the Abbey of Vertheuil and the Fort Médoc built by Vauban. The route will follow the “Road of the Chateaux” well known for their wine… and some Chateaux for their unusual architecture. You will go to Paulliac, the Médoc capital. Its 18 “grands Crus Classes” and its charming little harbour make this place an inescapable destination with glorious chateaux, from Latour to Lafite Rothschild. In the late afternoon you will be welcomed in a “3 epis” charming guest house located in the middle of the vineyards. The landlords are charming and friend. Each room offers high comfort with en-suite bathroom. For dinner, your hosts will offer you local delicacies and refined cuisine using fresh and local products of quality. This area of the Médoc is fascinating with its unrecognized landscapes which unfold in front of the cyclist, offering new sensations. This trip to the headland of the Médoc is an easy ride, dedicated to the atmosphere of the atlantics until the end of its territory. You will first go alongside the estuary, in a wild Medoc where migrating species of fish and birds find sanctuary. On the banks of the Gironde the scenery of tiny fishing ports reminds the land of Carmargue. Some short breaks are recommended by alongside the estuary, in Saint-Christoly, or La Marechale, small charming fishing ports with grounded boats. The Richard lighthouse offers a magnificent view of the estuary. You will go on to the Médoc’s headland passing by Soulac, a charming little balneal town; which melts into the green, pine perfumed landscape and sand beaches. From the boat, you can enjoy the view of Royan, the Cordouan lighthouse and the cliffs of Meshers on the right. You will then join the “rive charentaise” of the estuary of Gironde. You will arrive to your accommodation in Royan, by the end of afternoon. Night and breakfast in a 3 star hotel, on the seafront. The Territory of the Royannais offers an infinite variety of landscapes to the joy of the strollers. Pine forests, marsh, coast, cliffs, small picturesque ports, oyster-farming landscapes, rural areas. The artisanal village of Talmont-sur-Gironde, it’s church and blooming streets; the cave dweller dug in the limestone cliffs of Meshers-sur-Gironde, the archaeological site of Fa and the monolithic retreat of Saint Martial constitute great stops during this stroll. Located at the entrance of Gironde, Royan has been a seaside town for about two centuries. The town centre distinguished itself by its incredible architecture. Around the beach of La Grande Conche, contemporary and “belle époque” villas alternate. You will leave Royan by taking the “boulevard Garnier” and its beautiful villas from the 19th century. You will stop at the Park of the estuary, « pole nature » de la Charente Maritime. You will enjoy its unique feel and wooden area, dominating the estuary. The Park offers nteractive exhibition and animations allowing you to discover “everything” about the estuary. You will cross Saint-Seurin-d’Uzet, the old capital of Caviar, with its port almost located in the centre of the village. More south, you will visit the wine-maker of Mortagne to discover all about the Pineau, Cognac and Charente’s wine. Mortagne-sur-Gironde, lays on the white cliffs, its fishing and sailing port make it a unique site in the area. You will stay in a charming guest house, opposite the port In the guest house the rooms are spacious, bright with en-suite. Dinner at the guest house or restaurant, night and breakfast. You will move away from the banks of the estuary and circulate then inside the land to discover the chateaux wine-making of Cognac and Pineau similar to St-Dizant-du-Gua. The tortuous roads will lead you past old windmills, sunflower fields, fountains, posh houses and sumptuous chateaux. The small roads in the marsh will make you join the banks of the estuary, where you will be able to feel the wildness and immensity of the area before reaching the vineyards of the Bordelais. First you will approach Cotes de Blaye then Cotes de Bourg by following the hills covered with wheat and vineyards. You will stay in a charming guest house, in the “Maisons de maître or Manoirs. The rooms are cosy, decorated with taste and own suit. Blooming park in the heart of the vineyard. Dinner at the guest house to savour the regional cuisine and wine. You will keep going along the banks of the estuary and discover Blaye and its famous citadel built by Vauban. Massive and majestic, the citadel dominates the estuary with over 13 ha in the heart of the city, then offering a magnificent view on the Gironde. Finally, you will go towards Bourg-sur-Gironde, alongside the “corniche Fleurie”, where many palm trees, pink laurels and green oaks participate to this mild climate. Stones amateurs will want to visit the village of Bourg sur Gironde, a jewel of architecture. On a roc, surrounded by walls, the village is among the most beautiful and preserved of the Estuary. Your journey will lead you to one of the oldest ornate caves in the world. Those caves are a remarkable evidence of the artistic skill of the Prehistoric man. Your last accommodation is in the heart of the vineyards of the Cotes de Bourg in the village of Bourg sur Gironde. The guest houses are in beautiful domains and magnificent houses. You will enjoy the quietness, gigantic parks for superb strolls among the blooming flowers and trees. Bright and old fashioned furnished rooms, with en-suite. Dinner at guest house or restaurant, with fresh and local products rich in flavour. 7 nights in 3 star hotels and charming guest houses.